As the hawkish debate on the "Iran Question" continues to possess Washington, most Americans' exposure to the country is limited to photos of a bespectacled, bearded Supreme Leader and an unshaven, uncouth firebrand of a President. But one American, Tom Loughlin, is adamant that the next President of American knows that Iran is a vibrant society of millions of people. Loughlin, an American-born lawyer-turned-photographer, has visited Iran three times to capture Iranian life for his installation, "Pictures of you: Images of Iran." Photos of sepia-eyed young women, downy-haired scholars, and dimpled-cheeked adolescents are part of Loughlin's innovative effort to humanize "the other," the Iranian people. This week, Loughlin is taking his exhibit to the Democratic National Convention in Denver in hopes that presidential contender Barack Obama makes eye contact with an Iranian day laborer with a shy smile, an Iranian girl wistfully playing with her silk scarf, and an Iranian professor with twinkling eyes and an iridescently white beard. "I want all Americans to have a chance to come face-to-face with their Iranian counterparts, and I want to document Americans' responses to the encounter," says Loughlin whose steel-blue eyes glisten with purpose. 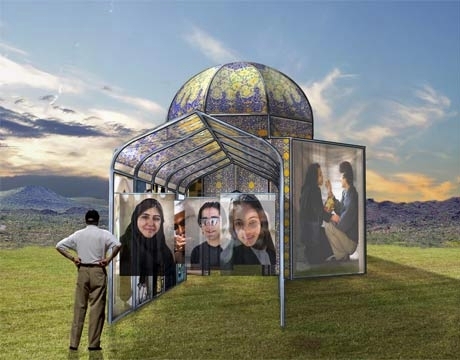 Loughlin's dynamic exhibit consists of an interactive 3-D still movie of photographs with sound and light that is displayed in a 26-foot-high octagonal dome, a dome which symbolizes openness and warmth in Persian culture. For Loughlin, the exhibit should elicit a visceral response from Americans, including Barack Obama, and make them grapple with their preconceptions. Loughlin hopes that Americans will confront their fear of "the other" and the photos of ordinary Iranians will encourage them to look more openly at other nations and cultures. And, ultimately, Loughlin hopes his exhibit will dissuade warmongering by American policymakers. Although Democratic presidential nominee Barack Obama is far less of a saber-rattler than John McCain, Obama has suggested that the United States one day might have to launch surgical missile strikes into Iran and Pakistan to keep extremists from getting control of nuclear bombs. The Bush Administration's flawed reliance on violence has no place at the Democratic National Convention and Americans must demand to know how presidential candidates, especially ones who allegedly represent "hope" and "change," will promote a better future for both Americans and Iranians. Loughlin is confident that recognizing the extraordinary commonality of the human experience is the first step in a new direction for a new America. Guzder is a freelance journalist in New York City and dual degree graduate of Columbia University's School of Journalism and School of International and Public Affairs. 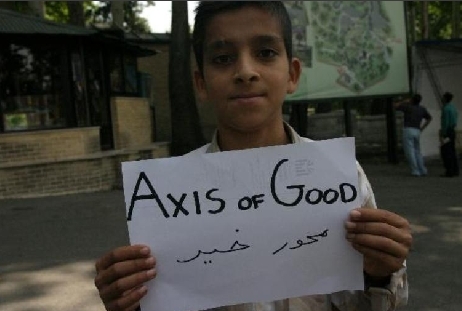 She spent 15 days in Iran in 2007. Please feel free to email her at dg2190@columbia.edu.